The Venerable Fr. 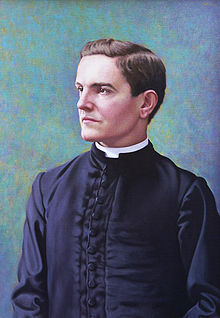 Michael J. McGivney founded the Knights of Columbus in 1882 at St. Mary’s Parish in New Haven, Connecticut. At a time when many Catholic immigrants found themselves in dangerous and vulnerable positions, Fr. McGivney saw the need for an organization to take care of those left behind by the death of the family breadwinner. This organization is committed to our principles of Charity for those in need, Unity as a Catholic organization, Fraternity with our brother knights and their families and Patriotism as the Knights remind the world that Catholics support their nations and are amongst the greatest citizens. Today, the Knights of Columbus and their families remain true to these principles and work to spread our Catholic faith, morals and values in our parishes, communities and around the world.